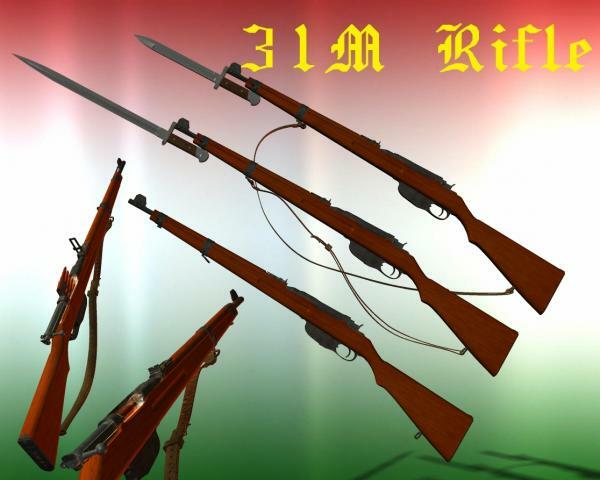 This is a model of old Military Rifle for Poser. This item intended to use alone or with Military Bicycle or with Poser people like Props. The Rifle has many smal details, animating with dials on the Body. This Rifle completed with spare cartridges, clips, cases and patron box too in a set and a target and RifleBox too. You may change the rifle shader to Xray shader and make interesting pictures like Xray showing all details of rifle. Tested on Poser 6 and Poser Pro on Windows Vista 32 bit. Billmox (3 days ago) Inappropriate? headwax (2 years ago) Inappropriate? sukyL (4 years ago) Inappropriate? Thanks for sharing your work! This is exactly what I need for a scene. redcityman (6 years ago) Inappropriate? 68fordfalcon (6 years ago) Inappropriate? I've always loved bolt actions. Very nice. Thank you for sharing this with us. Excellent, thank you. Your work is awesome! nyanpu (7 years ago) Inappropriate? A wonderful model and a great compliment to you military bicycle! I hope you will consider a Hungarian military uniform in the future please.. thank you for sharing your considerable modeling talent!! !